Read that last sentence out loud. Did you pronounce sherbet with a second "r" so it rhymes with "Herbert"? If you did, you're not alone, despite the fact that there decidedly isn't another "r" in there. 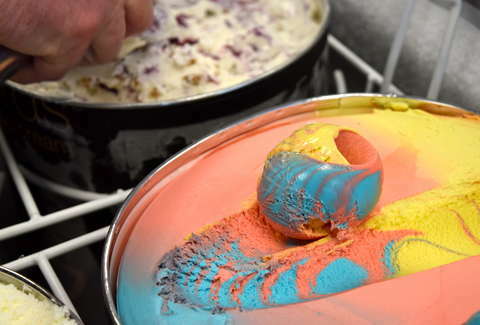 For some reason, mispronouncing and misspelling the fruity frozen dessert has become all but standard practice — to the point that dictionaries list “sherbert” as an alternative spelling. This linguistic quandary has increasingly come into focus over the last year or so, and at least three outlets have pondered the reason behind the rampant yet subtle bungling of the word. Unfortunately, the unsatisfying short answer is that there doesn't seem to be a definitive reason, though there are some fascinating theories worth considering. According to Michael Adams, an English language history professor who spoke to Smithsonian, we came to collectively accept "sherbert" because that's how we want to hear it pronounced. In short, there's an inherent habit among English speakers to unconsciously rhyme syllables that look like one another, even when it's incorrect. "Sherbet is begging to be pronounced Herbert on this 'principle'," he said. "It isn't a type of systematic change in language, but a lexical change." Add to that the fact that people have been referring to the colorful scooped snack incorrectly for generations and inadvertently passing down the tendency to add an "r" for generations. Another especially compelling theory blames the whole brouhaha squarely on a hit song from the Big Band era called "Shoot the Sherbet To Me Herbert," which hit radio waves in 1939. In the title, sherbet is spelled correctly, but in the song, it's bent so as to rhyme with the man's name, and voila: the sherbet/"sherbert" dilemma was born. Well, maybe. Whatever the real reason may be for why everyone gets sherbet's name wrong, there's no disputing that orange is by far the best flavor.